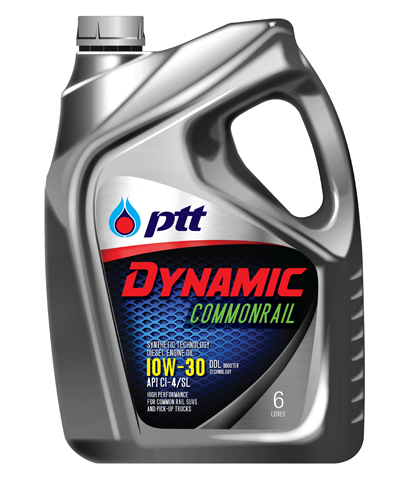 [DYNAMIC COMMONRAIL] น้ำมันเครื่องเทคโนโลยีสังเคราะห์ ผสมผสานเทคโนโลยี DDL Booster เหมาะสำหรับเครื่องยนต์ดีเซลที่มีระบบฉีดเชื้อเพลิงแบบ Common Rail เช่น รถปิคอัพ, รถยนต์อเนกประสงค์ MPV และ SUV Synthetic technology diesel engine oil with DDL Booster technology. Recommended for high performance diesel vehicles with common rail injection system including MPVs and SUVs. • Designed for high performance common rail diesel engines of Pick up Trucks and SUVs (PPVs) with both of 2WD and 4WD system such as Toyota, Isuzu, Nissan, Mitsubishi etc. • Suitable for all models of diesel pick up trucks and also for commercial vehicles where require SAE 10W-30 and API CI-4 or lower.